Q: So, tell us a little bit about yourself outside the Dungeon. A: Let’s see…I am a mother of 2 little boys (Gryffinboy and Slytherboy) and currently live in the Portland, Oregon area. I spent about 9 1/2 years in the US Navy working on air traffic control radar electronics. The hubby and I were both on the same ship when we meet. In fact we were in the same division just different departments. I learned how to crochet back when I was a teenager in the 1980s from my mother and I taught myself how to knit back in the early 2000s. And now I can knit, crochet, sew, spin, do bead work. I am also the person who assembles furniture in the house. Q: What is your favorite thing to Craft? A: Lately I have been on this small shawl kick. 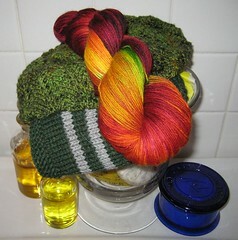 But I also knit socks, dishcloths, hats, scarves, and crochet small items for the boys (Gryffinboy and Slytherboy). I also wish I had more spinning time. Maybe next month. For the picture, I have chosen my Simple Yet Effective Slytherin Shawl. Why? Because it is made with my very own handspun yarn. Q: What form would your patronus take and why? A: That would be a black cat. I used to have a black cat many years ago and she was the greatest. Cats give you this “yeah, whatever” look plus they get to take cat naps. I wish I could take cat naps. Q: Who is your ideal hottie and why? A: That would be Jeff Burton aka The Race Car Driver. This really shouldn’t surprise anyone. I have accepted the fact that I have a weakness for Southern boys and he is from Virginia. He has this most amazing boyish grin that I can not resist. And I figure if he can drive a race car at speeds faster than 170MPHs than he has really good reflexes and amazing powers of concentration. Q: Which class this term appeals to you most? A: This month I would have to go with Herbology and the fall celebration. For me, fall brings about pumpkins and my favorite holiday treat in the mellowcreme pumpkins. It also brings back fond memories of living in Maine with all of the beautiful leaf color changes. Plus it brings my favorite holiday of the year and that is Halloween. Q: Tell us a little about yourself outside the House Cup. A: Well, to the crafting world outside the Cup, I’m CraftyGryphon, and I have a knitblog. To the non-crafting world, I’m a writer/cartoonist/recovering lawyer with a bad totebag habit. “Recovering” means I practiced for a while, decided it wasn’t fun, and, once the student loans were paid off, quit. I still work in the field (banking & securities law), for other nice lawyers (they’re out there! ), and don’t miss the stress One Bit. The money… well, that would be nice, but to me, it’s not worth the price. It took a few years for my friends to realize that no, I really couldn’t answer their legal questions (practicing with an inactive license = Not Good), but they get it now, and I can at least point them to where they might find the answers on their own. I’ve actually been told, to my face, that I can’t be Slytherin, since I stopped practicing law and gave up The Monieees. That just makes me laugh - there are all sorts of ambition, and mine happens to be “to be happy”. Got it, done, I win. I don’t draw nearly as much as I should, and I’m woefully out of practice. I used to bleed cartoons, especially when stressed; then I managed to change it to writing. Now, thanks to HPKCHC, the yarn has taken over, and I bleed knitting. Frequently, I just make stuff up as I go (Acorn Disguise!) Seriously. I have, as I write this, finished EIGHTY projects this year. EIGHTY. My mind is boggling over that one. The really scary thing? I have A List of all the projects I haven’t finished yet, and right now (thanks to starting the Acorn Disguise) the number is 46. For several years, my big New Year’s Resolution was to get under 50 started-but-not-finished-and-yes-I-intend-to-finish-them things; this year, finally, it was to get under 40. I don’t think I’m going to make it - four of the projects I started this year, not counting Acorn Hat, aren’t finished - but I usually get a burst of speed in December, so who knows? A: The current portable thing I’m knitting/crocheting/whatever! I have a pretty long commute, so I’m guaranteed at least 2h of knitting time a day. It really helps if I’m working on something that doesn’t need to be draped over the stranger sitting next to me! I tend to carry a few projects with me at any given moment. As I type this, my bag has a cross-stitched “Wicked” necklace insert that’s about 3/4 done - but is 1 over 30, so not so great on bumpy buses; my Nigh-Impenetrable Acorn Disguise for Transfiguration, which I’ve hopefully turned in by the time you’re reading this; materials to make another Garlic Bulb Wrist Corsage to test the pattern I wrote up for it; and the yarn for a blanket square that needs knitting. I should be carrying around my O.W.L., too, but I forgot to add it to the collection this morning. Besides, it takes concentration to get the Celtic knotwork started; Acorn Disguise is easier. A: I’d like to think I’d get a mountain lion, which is the critter I saw as my avatar growing up. In reality, I’d probably get either a rabbit (my mother loves rabbits, and her influence would be strong on a wee witch) or - shudder - a squirrel. Squirrels and I have had a life-long enmity. They find me and surround me, menacingly, if I remain in the open for more than an hour. (Okay, probably not just an hour, but there have been Incidents.) So, since the universe definitely has a sense of humor, a squirrel it would be. A: I’ve always had a thing for tall men with dark, wavy hair and light eyes, a la Pierce Brosnan and/or Hugh Jackman. It’s no accident my husband is 6’4” with that coloring & great hair! (I’ll always have a soft spot for Adam Baldwin, though. I’m glad Chuck made it past first season! A: The loudest squeal-upon-reading-the-assignment was for Herbology, when I realized I could fit my Owls sweater into a class. I have fun with all of them, though. History of Magic was the easiest (except for the Lion Rampant glass cozy), since a basic glass cozy goes really, really fast for me now. Muggle Studies will likely wind up being the hardest - I knit left-handed/eastern reversed uncrossed (or something like that? ), so double knitting doesn’t work well for me. I’ll have to play with it a lot between terms to figure out how to get mine to look right! I say “likely” because I still have to knit a clock (and figure out how to get it to run) and a mousetrap. Yeah. A clock and a mousetrap. I need to stop doing the research part of a class first and, instead, hit my queue, then the Ravelry patterns search FIRST to find things that would work - instead of writing fun write-ups that I then have to live (knit?) up to. How about a cartoon? Yes, the rule for Three Minute Sketch Theater is NO MORE than one minute per page. Period! There had been nothing more he could do, he thought. No matter how often you tell the young, some things must be learned from experience. “Late again, youngling,” Grandfather growled. "… and it brings disgrace to the family. I know, I know,” the youngster rolled his yellow eyes. “Ha! I’d like to see the human that can catch me!” Toothsome Bounder howled triumphantly, then bounced off a nearby rock, caught off-guard by the older wolf’s well-placed blow. Grandfather recalled the snap of the steel jaws, the bark of shock from his favorite grandchild, the whines of pain, silenced once the humans had found their prey. There had been nothing more he could do, he thought. No matter how often you tell the young, some things must be learned from experience; the weight of words means nothing. There. The two of those combined should give you a pretty good picture of my warped little Slytherin self! Tune in next time when....okay, we're not really that coordinated, but tune in next time. Or leave us a comment and tell us who you would like to see interviewed? Is there a particular snake you are curious to know more about? Want to be interviewed yourself, but don't want anyone to know it was your idea - pm me - I'll interview anyone. Alan Rickman reading this in disguise as a middle aged knitter - pm me your phone number pleeeeease. Hi everyone! Dreamy Jamie (a.k.a. suenosdejmi a.k.a. part of the Quidditch Coaching Staff) reporting in with some fun Slytherin Quidditch. If you didn't know, my specific job as part of the Quidditch Coaching staff is to run the challenges, and this term our challenges are taking place as House Pride Exhibitions. Lots of cheering took place too, over 200 cheers for the House of Slytherin! There were loads and loads of awesome ones, but these were some of my favorites. In written awesomeness, Bidibid opened the HPE with the Slytherin Song of Merry Beasts. Bidibid brought her Alot of Pride to the Pitch to cheer us on. Look at the cute little pompoms. Seakame drew a lovely picture to show her pride! 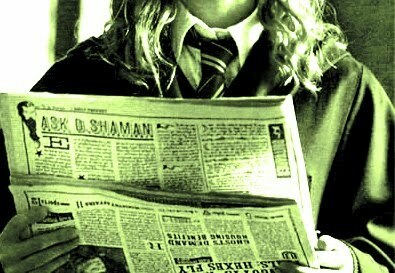 These just scratch the surface of the AWESOME that was the Slytherin HPE. If you didn't check it out, you should! It started here. Stay tuned for more Slytherin Quidditch Awesome! Greetings, I'm Rockinsticks and this is Weekend Report. Our top story this week is the alarming approach of Hurricane Lastdaytoturninclasses expected to make Dungeon fall in less than 9 days. Slytherins are encouraged to find a beverage of their choice and a comfy chair and knit, crochet, spin or dye at a crazy level of Bellatrix or higher. To that end I've compiled the following list of small quick projects. For Transfiguration how about whipping up a quick piggie mask or a lovely little lace mask or even a felted eye patch. I'm thinking the felted eye patch could be a lovely way of disgusting your mad eye when in muggle society. In DADA I will confess that as a child I was dreadfully afraid of vampires and would wrap my braided hair around my neck to sleep. To that end you could make a cable cowl in your hair color. If you're concern is zombies, how about a brain hat to throw them off. By the time they realize it isn't your real brain you'll be long gone. In Potions, yeah - I'm not really comfortable commenting on other people's bad habits - good luck with this one. For Muggle Studies if you can get away from the teeeee-veeeeee try a tardis dishcloth or better yet commemorate The Simpsons with marge hair. Most excellent. Herbology is all about nature in fall. I find this little leaf mask really charming. You could also modify the tree of the dead hat by crocheting it in a fall color and weaving a story about the whomping willow. Finally who can resist pumpkin booties. History of Magic is all about Ghosts. Maybe you smuggled some not rotten wine into the death day party in this Ghost bottle cozy. Or perhaps you thought they'd talk to you more willingly if you were wrapped in Jacob Marley type chains. Divination much like Potions is rather personal this month, but if it is October 30th and you are one class shy of Ultimate Quest how about a tea cup handle cozy or a knitted crystal ball and a story about how the future appears to be quite "woolly". Finally Charms. Perhaps you want to head back to the lacy Victorian era with a pair of lovely lace cuffs or maybe you are just going to hop back to the day you dropped your new phone shattering the screen and work up this delightful little squid phone case. In Sports - If you are into something new perhaps stop by the pitch and cheer for the Hufflepuff House Pride Exhibition. No we don't get points, but they did bring us muffins last month when we were all bummed out. In Weather - Can't see anything for the cloud of OWLs circling over the weather station. Speaking of OWLs - The following have turned in a lovely showing of 50%, Joseybug, Needlediva, Bidbid, Rockinsticks, Brittanylane, Mkissa, Eurekas, Knitsquid, Folk, Drusillawormwood, and Peanutzmom. 550 points for Slytherin! Lets all give a hand to Aerieiris and Cattiekins who are embroiled in the quest for a NEWT. Cattiekins is showing outstanding skill with her vest and blanket! Forgivable Curse of the week - Kiss my Alpaca. And from the Subhuman Interest Desk lets talk about swaps. I personally want to thank Abycat and Peanutzmom for organizing the swaps. I know its been said before, but I think it really pulled people out of the glum. I had an absolute blast shopping for treats and trinkets. Yes, I will admit to purchasing a plastic cauldron to use as my new knitting basket - selfish I am. If you didn't formally join the swaps, set up one of your own. PM someone and ask them their favorite color and address. It feels really good to package up a surprise for someone and so many of us are going to be so happy to get our little envelopes of love at the end of the year. And a question - as I typed the phrase "beverage of their choice" next to the photo up top I noticed that it looks like Ron and Harry are submitting a urine sample to Snape. Does anyone else see that? I mean I don't really see Snape as an apple juice man and that doesn't look like fire whiskey. Well, that is all the news for this weekend. As the month winds down keep knitting strong and posting often. Welcome to Meet Your Bloggers Part Duex. Today we sneak up on Caitirin and Moongirlknits. Q: Tell us a little bit about yourself outside the house cup. A: I am a librarian at a university library. I'm fantastically lucky to be living in one of the few states that allows me to be legally married to my beautiful wife, Elaby, and I have two spastic cats. Outside of fiber crafts I love to cook and I'm an avid reader and fiction writer. My favorite author at the moment is Jim Butcher (The Dresden Files) and I'm REALLY looking forward to the National Novel Writing Month (http://nanowrimo.org/) next month. It'll be my 8th year writing for it. A: I love knitting fingerless gloves and I love making anything out of rainbow yarn. I'm almost finished with my very first scary lace project, this diamond shawl knit in awesome rainbow yarn (Kauni effectgarn). I also love spinning, I got a wheel at the beginning of this year and I've been spinning miles of yarn on it. BFL has been my favorite fiber so far because it's so soft and it spins like a dream. A: My patronus would probably take the form of a house cat, my favorite animal. I'd be mixed colors and definitely a mixed breed cat. Smart and quick but often lazy and contrary. Also able to fiercely defend the things I care about. A: My favorite hottie is Judi Dench. Because I think older women are very under-appreciated and to be her age and still be so amazingly talented, beautiful, and dynamic is something truly impressive. I find her inspiring and very charismatic. She reminds me to consider finding the extraordinary in everything. And because she is GORGEOUS. A: I have to say that although Muggle Studies is really exciting this month, the class that I am most looking forward to is Herbology. I love fall colors and leaf patterns and I really want to knit another Foliage hat for my wife to wear when she comes to Rhinebeck with me. I'm racing the clock to finish that rainbow shawl (4 LONG LONG rows left) before THIS WEEKEND, but I just might be able to get another hat done. Here's to hoping! Q: Tell us a little bit about yourself outside the cup. A: Outside the cup, I am a teenager in high school - in fact, I'm one of the youngest members of the House Cup. Besides working with fiber, I love to cook and bake, to read, to write, and to work with children - when I grow up I want to be a teacher (that beloved phrase...when I grow up...heh). However, unfortunately, I don't get very much time to do any of these things because of school. Gaah. I love the woods and snow and fall and winter, am slightly old-fashioned, and have been called "Hermionie Granger" more times than I can count ( I know, I don't get it either). A: I have no idea. Maybe a hedgehog, because they're all prickly and protective on the outside, but when you get to know them they're all soft and cuddly. Also, they're my favourite animals. Or maybe a dragon, because they're gorgeous and scary at the same time, and incredibly mysterious. Oh, and they can fly. FLY. That ought to be reason enough. A: This month? I have to say, I really love how you could fit a wide variety of projects into several of them. for instance - right now, I'm working on a pretty lacy-y neckwarmer and I could fit it into Divination, because I'm planning to dye it with tea, into Muggle Studies, because it reminds me of my favorite anime series (it's Akage No An if anyone is wondering - Anne of Green Gables - I love it with all my heart, as I do the first three books), or into Charms because it is an object that was worn at some point in history. Also, DADA, because it would protect my neck from vampires, which are a form of the undead. On second thought, once I dye it, it could fit into any of the eight classes - provided I tell the right story. But that's probably what I really do like about this month's classes - that we could fit in something into any of them. P.S. Seriously? My stalker-person for the Yule swap really should be happy right now. Thus ends another episode of Bloggers of the moment. This is Rockinsticks signing off. Knit sinuous - it feels good. Hey all! This is moongirlknits, bringing you this weekend's report! With the month half-over, classes are pouring in. I loved looking through the Herbology thread, where the emphasis this month is fall colours - for example, check out DrusillaWormwood's homework (turn-in post No. 250). I wish the yarn was mine - these colours are so vibrant. Please, when turning in classes, remember to include your ravelry name and the fact that you are from the House of Slytherin. Otherwise you won't be able to earn bonus points! Of course, if you're still not quite sure what to make for a class, check out Fosterson's handy-dandy October classes review - with ideas of what to make and ratings of class difficulty - posted in the Slytherin Study Hall Thread (post No. 43). If you have something unfinished from last month, you can always turn it into Detention! Starting this month, you can earn ten points for your first project. However, Detention still does not count for the one-class-a-month requirement. OWLs must be turned in for mid-term points by the end of October! OWL modifications are no longer accepted. Keep on working on the OWLs and NEWTs, guys! Speaking of NEWTs, there is a new contest! Design the NEWT badges and you could win awesome prizes (such as yarn or knitting books)! Designs may be submitted until 25 October, and voting will be held during the first half of November. Go and check out the submissions thread (in the main group) for details, or just to see the pretties! Sports - Although the House Pride Exhibition is over (we scored a total of 1,290 points! Congrats Slytherins! ), regular Quidditch is still open! If you're stuck on what to make for classes, flying may be just the thing to clear your mind. Or, obviously, you could go visit the Study Hall. 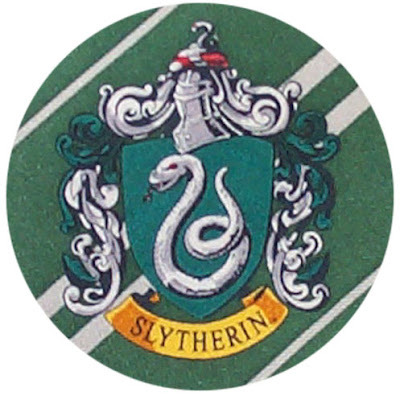 The Slytherin Pride Swap is currently underway, with 43 people participating! Many thanks go to abycat, the wonderful swap organizer! As a reminder - the mailing deadline is 31 October (which is a Sunday, so depending on where you live it may be better to make it the 30 or even the 29). The Slytherin Yule Exchange also has started, with 35 participants! It is organized by the amazing peanutzmom. The mailing deadline is 1 December. Please remember that this is a secret swap, so the person you're mailing the package to shouldn't know that you were the one who sent it until they recieve it! Up here in the Northern Hemisphere, it is getting colder and colder, which means that wool season is coming soon! I know that I have had cause to dig out my gloves, hats, and scarves when I walk to the bus stop in the morning before the sun rises - it is cold! I'm hoping that wherever you are, you're having a lovely fall or spring! Of course, sometimes RL (real life) gets in the way of crafting. If this is the case, don't worry! PM our wonderful HoH Girlywithatwist - I'm sure that you'll be able to figure something out. If you have any suggestions, there is a new Suggestion Box in the Snake Pit! Or, if it's something concerning the entire cup, the link to the Suggestion Box is in the group description of the HPKCHC. Remember that the staff are dedicated to improving the House Cup, and are always open to ideas! We still have half of term left! Get crafting and let's win the House Cup back from Ravenclaw! Ever wondered who writes your blog? Well too bad - we're going to tell you anyway. Today we begin our series of interviews with the staff of the Dungeon Bulletin Board with JuliaV927 and Rockinsticks. Q. Tell us a little about yourself outside the cup. A. I'm a newly minted lawyer with overly ambitious knitting plans and not enough time in the day to carry them all out. If I could get my hands on any one fictional invention it would be a time-turner (it just seems more practical than a Tardis). My dream knitting goal is to make everything in my queue, but I'll settle for finishing all of my sweater WIPs. Q. What is your favorite thing to craft? A. My favorite thing? Probably gloves or mittens, though socks are slowly growing on me. Q. What form would your patronus take and why? He's quite good at scaring my brother's Siberian husky, so compared to that a dementor or two should be no problem. Q. Who is your ideal hottie and why? A. My ideal hottie would be a cross between Sencer Reid from Criminal Minds (he's so smart!) and the Oh so handsome Christian Bale. Q. Which class this month appeals to you the most? A. I love the prompt for History of Magic. I always wanted to go to a ghost's Deathday party! My favorite FO: the Adipose! A. Well, I'm a semi-reformed architect currently working for a muggle equivalent of the Ministry of Magic. In the evenings I often play the role of stegosaurus in a rousing game of dinosaurs with my three mountain trolls. I knit too much. A. Rabid Rabbit. I've been mother to house rabbits in the past and learned that they are much like me - by all appearances cute and fluffy, but with sharp nasty little teeth and big clompy feet. A. We can probably skip this question. If there are readers out there they've seen vestiges of my shameless Alan Rickman obsession. Basically though I've got a thing for the dark and damaged. Q. Which class appeals to you the most this month? A. Charms. Time travel has always fascinated me. Now don't go running off to look at my project. It's not one of my most stunning efforts. I just got all flustered when looking at the stack of history of fashion books at the library and ended up doing something kinda meh. That is all for today. Tune in next week for more about the bloggers that you love to love. Greetings. I'm Rockinsticks and this is ........... Weekend Report. The top story this week is of course the posting of a new slew of classes. Are you ready to craft your defenses against the undead, take a trip backward or forward in time, maybe spend a little time chatting with the ghosts of Hogwarts? Aren't we lucky (wink wink nudge nudge) that our Slytherin Unity theme this month just happens to be Zombies v. Humans. Do you support the undead or wish to defend mankind against them? I'm a "if you can't beat them join them" kindda gal so I've joined team zombie and have crafted something zombirific. Those of you opting for team human - craft something that will combat zombies. We will be doing a mass posting of these projects between Octotober 28th and 31st. Weather - A light smattering of laceweight is predicted for Monday evening with stitch marker sized hail. In sports - Quidditch is still on. Remember kids - one quidditch project is worth the same points as a class project, so if you're feeling a little meh about classwork take a little zip around the pitch in our or any other house colors to clear your head and pull some points in. Our first October Wildlife Review is extremely triumphant. All hail Mkissa, Peanutzmom, Dusillawormwood, Folk, Knitsquid and Eurekas who all submitted their 50% OWLs this week. You have inspired me to pick mine up again despite the nip in the nether regions it gave me two weeks ago. Speaking of OWL disenchantment, you have until October 15th (yes, next Friday) to post a change request. Forgivable Curse of the week - Son of a stitch! I'm sure my fellow snakes will not be cursing Abycat and Peanutzmom who have organized two separate and delightful swaps to cheer us all up. If you signed up for either the Slytherin Yule Exchange or the Slytherin Pride Swap keep your eyes open for owls with pms announcing your intended giftee. And lastly from our sub-human interest desk I'm going to abuse my powers as blog reporter and try to con my fellow snakes into doing my homework this week. As you know Divination class is taking us to the realms of tassomancy and scrying this month. Well I tried scrying with a bowl of vodka but it kept disappearing so here is my tea leaf photo. What do you see? Leave a comment and let me know what you see in my knitting future. Signing off and saying slither on my sinuous pals. Today we sneak up on Madduckinc of the Anaconda Nest. Q: Who (if anyone) first taught you to knit/crochet/spin/weave? A: My best friend, Tawnyowl98, a fellow 2nd year snake taught me how to knit, spin and crochet, a little. Q: What's your favorite type of item to make? A: My favorite item would have to be wrist warmers. They are quick, easy (in most cases), and generally cool. Q: If you're planning on doing OWLS, which one are you looking forward to most? A: I'm considering making an OWL, if I can find the time! I think it will be most fun to pick a pattern with techniques that I have never done before, in order to make it a learning experience. Q: If you're planning on OWLS, which one scares you the most? A: Getting the darn thing done in time! Q: What's the one pattern you think everyone should make? A: I think everyone should make the Dark Mark Illusion Scarf Pattern, because, what is cooler than a hidden dark mark? Q: What's your absolute favorite item you've seen made on Ravelry? A: My favorite item is the Tailor of Gloucester: Lady Mouse. http://www.ravelry.com/patterns/library/tailor-of-gloucester-lady-mouseI have always love knit plushes, and Beatrix Potter has been one of my favorite authors since I was very small. Q: What's your idea of a dream crafting vacation? A: My dream crafting vacation would be a knitting retreat in the countryside. Q: Who tends to get most of the items you create? A: I have never really given anyone else a knit project, but I am working on a Nintendo DS case for my brother. Q: What's your favorite thing, so far, about being a Slytherin? A: My favorite thing about being a Slytherin.....Probably the fact that all we do in the common room is look at pretty people! And, of course, the affinity for snakes. Thank you to Muddduckinc for her responses. I want y'all to bear with me for a few minutes while I ramble. For the past week or so I have been trying to come up with something worthy of reading. The days passed and I was working on class projects and dealing with two little boys. Then Oct 1st came and still nothing. This morning I spent time watching the race and trying to get some sort of inspiration from the Race Car Driver. But even he was having car issues. And there was nothing. In an attempt to clear my mind, I started painting the edges in Slytherboy's room. It will be a pretty shade of green. Pea pod green to be more exact. This is far better than the dark teal like color it used to be. And that is when inspiration struck. So I spent the rest of the time hoping I would remember what just came to my mind and fearing I would forget it all. September was a long month for us. The excitement of a new term was quickly overshadowed by an unfortunate incident which doesn't need to be brought up yet again. The one thing that kept me going through it all was my steadfast belief that we would survive. We may have stumbled but we will not fall. Why? 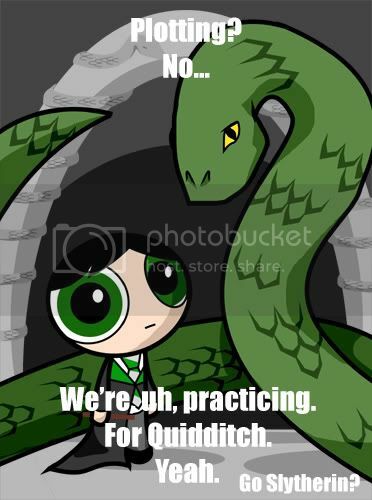 Because we are Slytherin. And nothing can keep us from doing what we do best. Plotting and doing everything in our power to get that House Cup back from Ravenclaw. Then I thought that many of our newer Snakes may not know a lot about me. So here I am in a nutshell. I have been here since the beginning of House Cup time. And currently I am one of only two 7th year Slytherins. I am multi-crafty in the I can knit, crochet, sew, spin, and do beadwork. I am a mother to 2 little boys - Ravenboy and Slytherboy. There is only 1 hottie that I am fiercely loyal to and that is the Race Car Driver. And I only spent 1 term outside of Slytherin. That was my 3rd term and I spent it in Hufflepuff. Despite the rough start, I believe we had a much better ending to September. The 4 days of Slytherin Pride proved we still had it. We can still be a factor in the Chase for the House Cup. The spirit of the Slytherins is still strong. But we have to believe in ourselves. So all I ask from everyone is that you do what you can. Every project counts. Remember that. Along with a new month come new classes and a new House Unity Theme. This month we're asking that all-important question: how would you survive the Zombie Apocalypse? Would you fight back the zombie hordes with the human survivors? Or would you join the growing ranks of the undead? Humans and zombies will battle it out this month with mass project turn-ins during the last weekend in October, Thursday Oct. 28th - Sunday Oct. 31st. Seakame is talking bonus point strategy and collecting project ideas in the Unity thread. My favorite suggestion so far? A severed monster finger that doubles as a chapstick cozy! Great project find, Sea-Jelly! The new class assignments have been posted for three days now. I've been so inspired by all the prompts that I'm convinced the professors have been secretly plotting behind my back, trying to make me forget all about working on my O.W.L. by plying me with new project ideas and clever challenges...honestly, do they have no shame? If I didn't think that trying to invent a working time-turner would cut way into my knitting time I'd be all over that. If you have yet to be caught in the professors' devious web of inspiration, keep an eye on Fosterson's Slytherin Study Hall to get a class by class breakdown of October and find great ideas for class projects. Also, just a reminder - O.W.L. midterm points will be awarded at the end of this month! Post a pic showing that you're halfway done by 11:59pm PST on Oct. 31st to get your 50 midterm points. In other Dungeon news, Abycat is hosting a Slytherin Pride Swap! Fill a package with one skein of yarn plus one extra goodie (<$10.00). Send it off to your swap partner and then wait anxiously by your mailbox to see what awesomeness you get in return. Sign up by October 9th if you want to participate. And now for Quidditch! Slytherin totally rocked the Pride challenge and scored 1290 points! Dreamy Jamie broke down the point earnings here. There were 46 Pride projects and 200 cheers! You can see LNS's Pride Project montage here or in the header of the Quidditch thread in The Dungeons! In other exciting Quidditch news, Rockinsticks has been nominated for a prize for her (cute cute cute) Snake Mittens! Congratulations Rockinsticks! 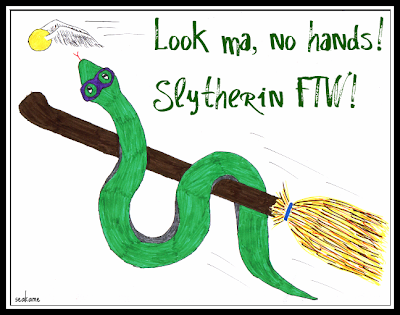 Looking for more Slytherin fun? The Ravelwealth Games are just starting up and Team Slytherin is playing to win! Based on the Commonwealth Games (...yeah, I had to look them up due to not actually living in a commonwealth nation...) the Ravelwealths are essentially a smaller version of the Ravelympics. The Games run from Oct. 3 - Oct. 14, so bring your wips or cast on a new project and join in the fun! HAVE A GREAT WEEK, SNAKES!